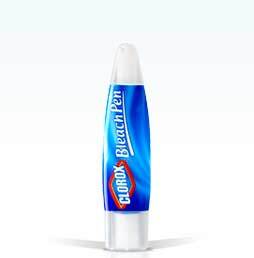 This pen works great, and the tip is very small incase you have white mixed with other colors on a fabric and you want to be careful not to get the bleach onto the colors. One thing I would recommend doing is washing the garment after you put the bleach onto it. If you don't wash it with a 15-30 minute period, the spots will turn yellowish. You need to get the bleach out beore that happens. Also, there are 2 sides to pen, one is a bit larger with a scrubber. The other is more of a fine tip. I am told that this also works on non-fabrics such as bathrooms and etc. If the grout is stained (for instance my boyfriend stained his kitchen tile grout by spilling red wine on the floor!) This works great on the grout to get it out and turn it white again. Make sure to shake it up well before use. One time I didn't shake before using it and i got a watery residue that came out instead of the gel bleach product. This pen worked well. I would definitely recommend it. Keep one in the laundry room for tough stains on whites! THIS IS A GREAT PRODUCT USED TO BUY IT AT SAFEWAY AND WALMART BUT NIW FIND IT IS NOT THERE ANYMORE.wILL TRY CANADIAN TIRE HOPE IT IS THERE! !